Ice loss is a major contributor to sea level rise. Glaciers have been shrinking and losing mass worldwide with the rate of melt faster in the past 20 years than it was prior to 1993. The melt of ice sheets has also been accelerating. The Greenland and Antarctic (Antarctic Peninsula and the Amundsen Sea sector of West Antarctica) ice sheets have lost more than four trillion metric tons over the past two decades. Global surface temperature has risen 1.6 degrees over roughly the past century. 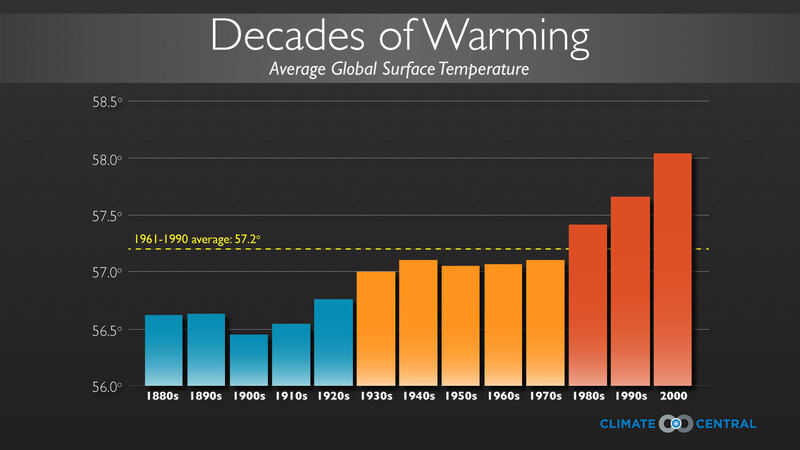 Each of the last three decades has been warmer than the preceding decades. The by-product of a warmer atmosphere is that it is able to hold more water. Water vapor has increased by roughly 4% since the 1970s. As we continue to warm, this will increase the contrast between dry and wet regions, while most regions will be vulnerable to increases in heavy precipitation events, even places where rainfall is decreasing. Average spring Northern Hemisphere snow cover extent decreased 1.6% per decade from 1967-2012. Permafrost is soil that is at or below freezing for two or more years. Observations indicate that permafrost temperatures have increased in most regions since the early 1980s and the overall amount of permafrost is shrinking. As the Arctic warms, methane and carbon dioxide trapped in permafrost is being released into the atmosphere, increasing the concentration of greenhouse gases in the atmosphere. Permafrost thaw in coastal areas increases the vulnerability of coastlines to erosion, infrastructure damage, and ecosystem changes. 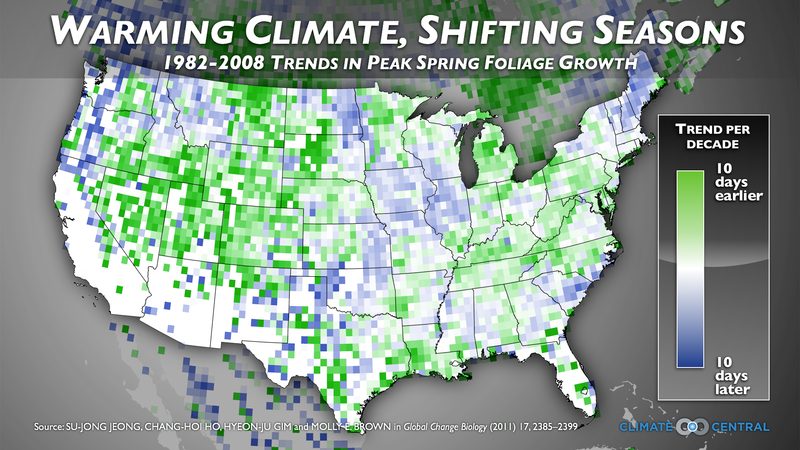 Over the past several decades, spring has been arriving an average of three days earlier in the U.S. (with state variability) while fall has been arriving later. This shift has broad impacts across entire ecosystems. Warmer springs mean that the flower buds are emerging earlier when frost is still a high risk, translating into fewer wildflowers and butterflies. It is also affecting migration patterns and spring snowpack, causing melt to begin earlier. Global average sea level has risen 7.5 inches over the past century, with the rate of rise accelerating over the last two decades. Warmer water expands, while melting glaciers and ice sheets are adding additional water to the oceans. 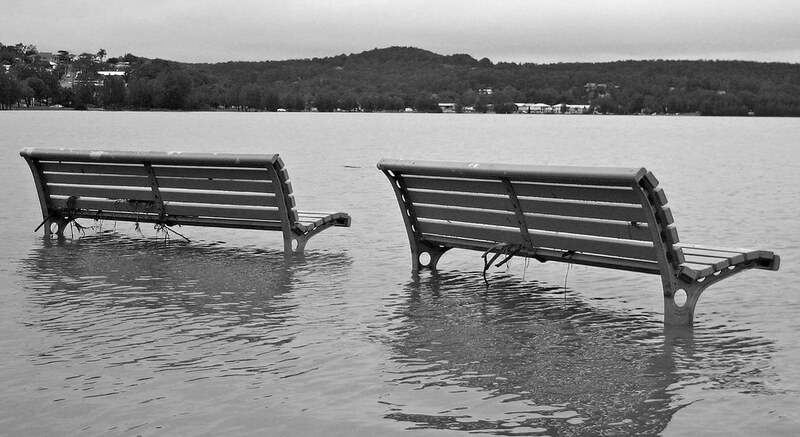 Sea levels rose almost twice as fast from 1993 to 2010 as they did from 1901 to 2010. The increase in greenhouse gases is not only warming the atmosphere - it's warming the oceans. From 1901 through 2012, sea surface temperatures rose at an average rate of 0.13 degrees per decade. The ocean is warming the most near the surface but also at depth. Water expands as it warms and this is contributing to sea level rise. The extent of Arctic sea ice has been decreasing 3.5 to 4.1% per decade (1979-2012). 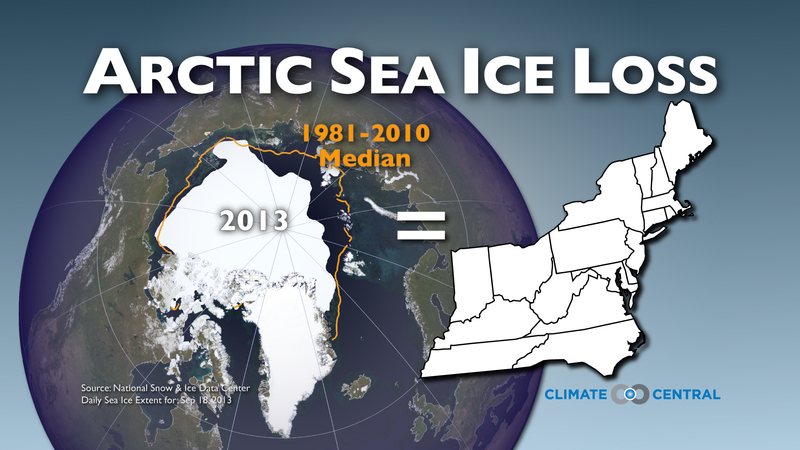 Multi-year ice, ice that lasts throughout the year, has decreased 11% per decade. During this same time, Antarctic sea ice extent increased 1.2-1.8% per decade. Sea ice is important because it reflects incoming radiation from the Sun and helps cool the planet. Since sea ice is frozen seawater already at the surface of the ocean, it does not affect global sea level. The ocean's ability to store and release heat over long periods of time gives it an important role in stabilizing the climate. Upper ocean heat content (0 to 2300 feet) has increased significantly over the past two decades. More than 90 percent of the warming that has happened on Earth over the past 50 years has occurred in the ocean. While the atmosphere has been spared the full extent of warming for now, heat already stored in the ocean will eventually be released, locking in additional warming in the future. The oceans are absorbing a large amount of the additional CO2. Carbon dioxide interacts with ocean water to form carbonic acid, lowering the ocean's pH. The pH of seawater has decreased by 0.1 since the beginning of the industrial era making the ocean 26% more acidic. This ocean acidification reduces the ability of marine organisms with shells or skeletons made of calcium carbonate (such as corals, krill, oysters, clams, and crabs) to survive, grow, and reproduce.